Students from Rachel Carson magnet program at Five Oaks Middle School ask about more than environmental issues. 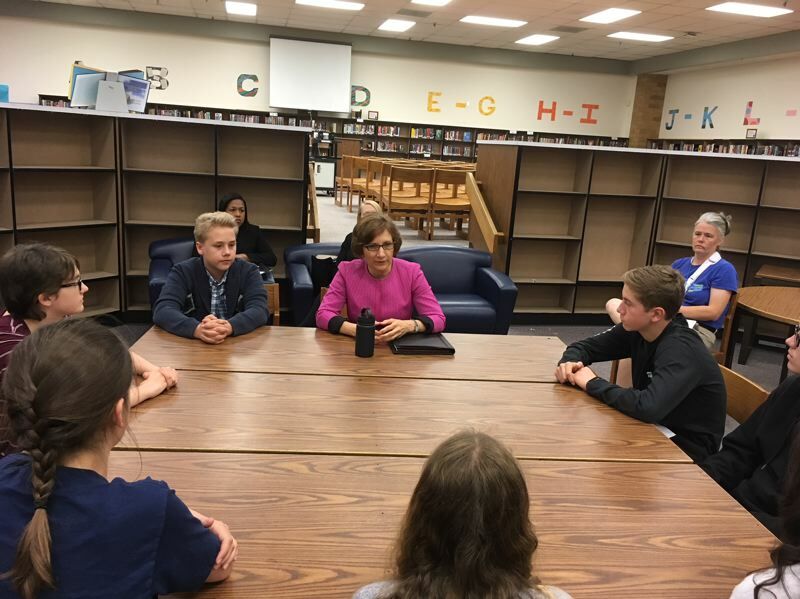 U.S. Rep. Suzanne Bonamici fielded numerous questions from a group of eight, then all 100 students, enrolled in the Rachel Carson environmental magnet school within Five Oaks Middle School in Beaverton. But even though Bonamici sits on the House education and science committees — and is the top Democrat on the environment subcommittee — many of the questions from the larger audience on Friday, May 11, were similar to those raised at her town hall meetings. 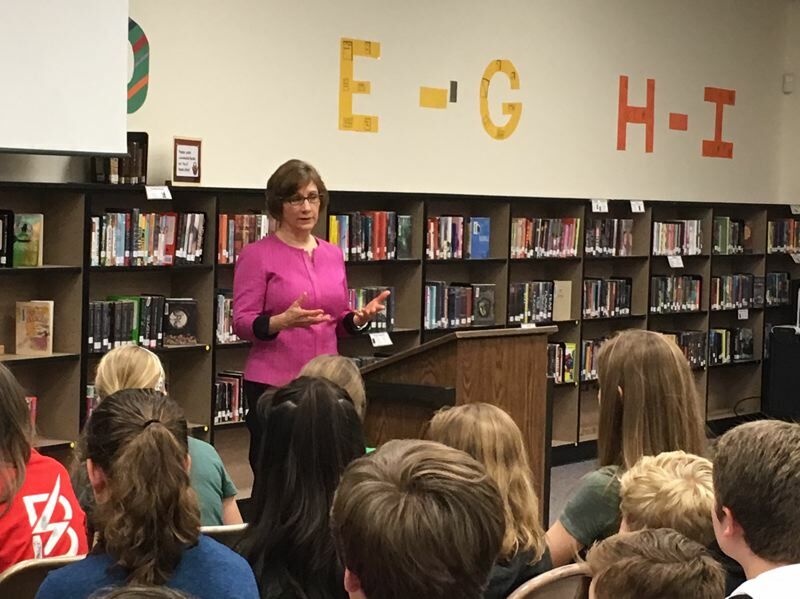 "You are obviously well-informed about what is happening in your community," said Bonamici, who has been the 1st District representative for six years, to the students gathered in the school library. There were several questions about federal gun laws — she favors broader criminal background checks, similar to what is in effect now in Oregon, plus additional mental health counseling — and also about health care, homelessness and undocumented immigrants. "Their questions were quite sophisticated — and very impressive," Bonamici said afterward. "It gives you hope for the future when you hear students who are so engaged and had great and challenging questions." On the House Committee on Education and the Workforce, Bonamici has been a vocal advocate of integrating arts with education in science, technology, engineering and math to form the acronym STEAM and bipartisan support for the concept. She also sits on the House Science, Space and Technology Committee. "I certainly support more choice within the public school system," she said. "You can see how these students are thriving." About 100 students are enrolled in the environmental magnet program named in honor of Rachel Carson, an American marine biologist and conservationist whose 1962 book "Silent Spring" is credited with advancing the modern movement for environmental protection. "These students have come because they are interested in learning more about the environment and integrating that into our curriculum," said Debbie Silva, a math teacher who is part of the program. The program mixes students from all three grade levels, some of whom are mentors to the younger ones — and some have followed in the path of older siblings. Tammy Schrader, also a math teacher and a co-facilitator of the program, said students make weekly site visits — field trips, but with specific lessons and community service in mind. "What they are learning in the classroom, they also are experiencing in the field," Schrader said. "They also learn how to be good mentors and good community members." Bonamici was asked by students in both sessions how she became involved in politics. Although her first job after graduation from law school was at the Federal Trade Commission, she said it was her concern for the education of her son and daughter in the early 1990s that led her into becoming active in schools. "I became an advocate in Salem for more funding and a more well-rounded education," she said. Her son is a graduate of Sunset High School, her daughter from a magnet school. There were a few lighter moments. After one student told Bonamici that one of her projects was working with animals that can help relieve human stress, Bonamici replied: "We need some of them in Congress."